MDScan Lite by STOIK Imaging, or Mobile Document Scanner, turns your mobile phone with camera into scanner. You can scan checks, receipts, business cards and multiple page documents by taking pictures with your phone. 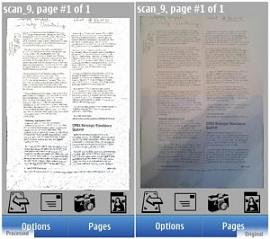 The difference between MDScan Lite and full version is that the lite version does not create PDF and save enhanced images. This entry was posted in Nokia N8 Applications on by Admin. How to Install Samsung Galaxy S10 Plus TWRP Recovery with ODIN? How to Bypass or Fix RMM State Lock on Samsung Android Phones?